One of the most common requirements is to be able to email a copy of the Form entry to various people. For example, if a building inspection is performed you may want to email a Certificate of Inspection to the building owner. Or if you are taking a product order from a customer, you might want to send them an order docket or invoice automatically. This is where the Email Connector for Forms comes in. You can add as many Connectors as you like to a Form, via the Connectors page. The Connectors page can be accessed from your Form design, settings or from the Screens listing if you mouse over the Form row in question. 1. Hover over the “Add Connector” button to see a list of the available Connectors. 2. This will refresh the page and display your Email Connector, ready for configuration. Note that at this stage nothing has been saved – you must click the Save button to save your Connector after you’ve finished setting it up. 3. Your first decision is what format you want your Form entry data to be sent as. This will send the Form entry data as plain text in the body of the email. Each field answered is placed on a new line. Sends a Form data as a CSV file attachment on the email. Sends a PDF file attachment on the email, generated using either a generic PDF output or the Word/Excel template provided. Sends a Microsoft Word attachment which is generated using a Word DOCX template you upload. Sends a Microsoft Excel attachment which is generated using a Excel XLSX template you upload. 4. Next you need to configure who the email should be sent to. Input a static list of email addresses, separated by a comma. An email will always be sent to every address in this field. This allows you to have dynamic behaviour based on the email address(es) input into a chosen Form field. For example, in an product order Form you may be capturing the customer’s email address in a field named “customerEmail”. You could then have the system automatically email an invoice or order confirmation to the customer, by setting the To Form Field to be customerEmail. 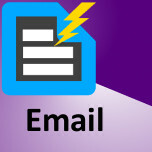 This allows you to automatically email the app user that captured and uploaded the Form entry. 5. Your Connector is now ready to go. Hit the Save button to save your changes and activate the Connector. There are a number of additional options that you can use to make your Email Connector extra awesome. The system will generate a default subject, body and attachment file name for the email it sends. However you may want to customise these values to make the email more personal. This is easily done – just hit the “customise email” link on the Connector. You will see that Subject, Body and Attachment Name fields are displayed for you to edit. Notice also that a hammer icon shows next to the fields. Clicking the hammer will open the Text Builder, which is where you can create dynamic text by injecting the answer values from fields in your Form. This lets you have truly dynamic emails being sent out automatically. Customise the output of your Form entry to your hearts desire with our powerful Data Template functionality. This lets you create Word or Excel templates that are injected with the Form answers to create any kind of PDF output you may need. The template is uploaded specifically to the chosen Connector, so you can have multiple Connectors that output different files. For example, you may send a PDF Certificate of Inspection to a building owner in one Email Connector, and send an Excel “Inspection Log” to your internal department address on a separate Email Connector. Learn all about templates in the Outputting Data with Templates area. For example you may have an Audit Form, which has a risk rating question with options like “Low”, “Medium” and “High”. If the user answers the risk rating as “High”, then you want an email to be sent to a supervisor for followup and action. Create and Manage Tasks. How to control size or resolution of images in Forms.. Connector Logs. Import Tasks from Excel. Syncing the App. Install FormsFly Trial the Android App. Edit Data Sources. Built In Data for Templates. Login to the Mobile App. Create a New Doc. API FormsFly System. Troubleshooting the app. Sizing Images in Word/Excel Output. Send Form Data to Google Spreadsheets. How to Login to the Platform. Screens, Docs aren’t on my device anymore.. Send a Task to a Mobile User. Manage Docs. Send Form Data to a Web Service.